Trying to do anything in New England during the frigid, snow-covered cold of winter can be difficult, but scrapping during this time of year can be next to impossible. Once you gain a little bit of experience after scrap metal recycling through a couple of snowy seasons, you’ll be able to adapt and hunt down scrap metal just as you would in the spring or summer. However, if you are new to scrapping and are trying to build up your own recycling business, these tips will help point you in the right direction. Don’t fight the season and try to do things the same way you would have if you were trying to hunt down scrap metal in June. Think about some of the seasonal aspects of this time of year and all the ways that you can capitalize on them in your scrap metal recycling. Christmas Lights – Check local trash dumpsters, cans and even area businesses for discarded holiday lights. In many cases, people will put away broken light strings and not discover that they are bad until they try to hang them the next year. So start looking around Thanksgiving all the way up past New Years for light strings. When you go to recycle metal in Westport at Mid-City Scrap, ask about recycling holiday lights. Many contain a lower insulated copper wire and can fetch a decent price for your efforts. Holiday Decorations – Many people use great big holiday decorations this time of year that are made of various metals. Aluminum sheeting, wrought iron and other materials are often discarded this time of year as residents and businesses sort through their old decorations. Put an ad in your local paper or Craigslist offering to pick up broken or unwanted holiday decorations (and lights) – you might be surprised at how many requests you receive. The cold weather may be a hindrance to some, but if you are serious about scrapping in Massachusetts, it’s time to put on some gloves and a well-insulated coat, and get out there to make some money. Think about the types of home and commercial repairs that occur during the winter months and be prepared to take advantage while you are working to hunt down scrap metal this time of year. Plumbing – There are a lot of frozen pipe calls in Southeastern Massachusetts, especially following a huge temperature drop or snow storm. Residential pipes, sprinkler systems and other types of plumbing can burst and won’t be able to be used again. It’s a good idea to establish a good working relationship with your local plumbers to augment your scrap metal recycling work. Some will just give you their excess pipe to avoid a trip to the dump, while others will sell it to you or offer to split the cost of recycling with you. HVAC – This is the time of year when people find out whether or not their heaters are up to snuff. 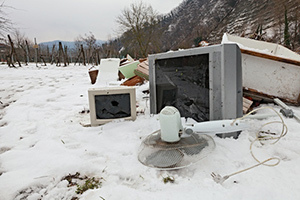 Damaged or broken heaters are often set out curb-side for pick-up, but you can also advertise your pick-up services in the local paper or Craigslist to take advantage of this type of scrap metal recycling opportunity. In addition to heaters, many people remove window A/C units for storage in the fall and winter. Unfortunately, many also get damaged in the process and will also get set out on the curb for pick-up. Considering the warm summers and freezing winters experienced in this area, HVAC scrapping in Massachusetts can be quite lucrative if you can corner the local market. Snow Plows & Shovels – You will also find that a lot of snow plow companies, tow truck companies and landscaping businesses are discarding broken plow blades, shovels and other metal-based equipment during this time of year. Keep an eye out while you hunt down scrap metal in the area or contact these businesses before the season starts to try and set up a pick-up arrangement for these items. The hustle and bustle of the holiday season leaves many people without a lot of spare time to take care of scrap metal recycling that they might otherwise do themselves. Post ads, give out business cards and place notices on popular community bulletin boards that offer your pick-up services. This is a great way to increase your scrap metal recycling business without having to spend all day hunting down scrap metal. Party Prep Clean-up – Many homeowners are planning for family and friends to come over for holiday parties and celebrations. In doing so, many choose this time of year to gut out garages, clean basements and clear attics to make room for storage. Offer to pick-up these items for free to save busy residents from having to recycle metal in Westport all the way from Cape Cod or anywhere else in the region. Day-to-Day Opportunities – Recycling has become very popular in the American northeast. Many homeowners and businesses are very informed about the importance of recycling and collect aluminum cans, bottles and plastics. But who wants to drive all those bags and bins of things out to the scrap metal recycling yard in the snow and frigid weather? Once again, posting notices that offer your FREE services will be very welcomed and appreciated by the locals. They will be able to continue recycling their goods and it won’t cost them a thing. Maximize Your Scrapping in Massachusetts at Mid-City Scrap! To make the most from your scrap metal recycling efforts, make sure to bring your scrap to a solid, reputable facility. Mid-City Scrap Iron & Salvage has many opportunities for you to recycle metal in Westport, without having to drive all over the state for the best deals. Call our office anytime to check on the rates we are paying for copper, stainless steel, iron and other common metals to make sure you maximize your earning potential.